Your enhanced listing allows you to add details about the exact service you provide, display your logo and feature in 5 service types and 5 service sectors. Service types are the types of marketing activity you offer services in, such as Email Marketing, SEO or CRM. Service sectors are the type of industry you supply to- such as Pharmaceutical, SME/SMB or Financial Services. You can write at length about who you are, what you offer and what makes you different, and provide details of your current and past clients and offer testimonials to help you attract customers. In addition, you can link through to your website and provide a phone number so prospective customers can easily get in touch. What are the benefits of the enhanced marketplace listing? 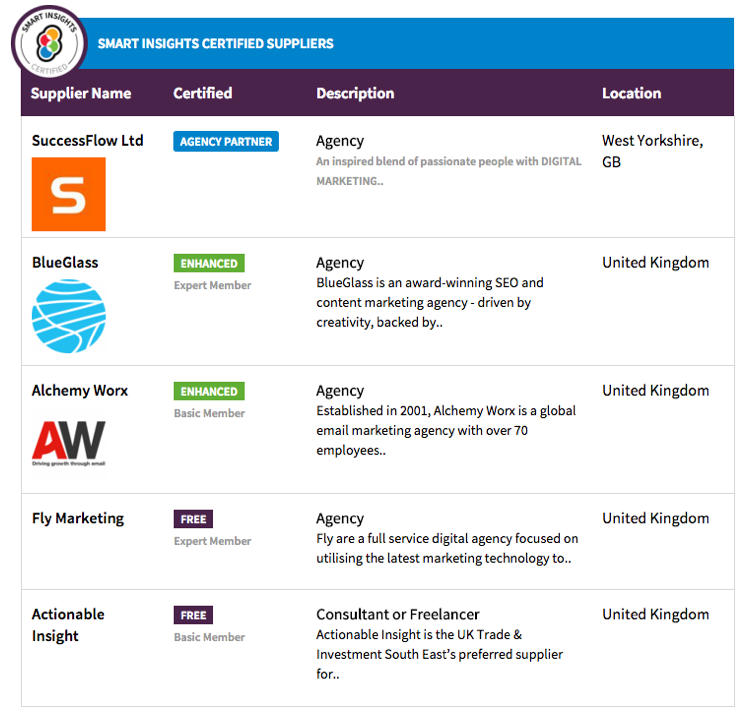 The Smart Insights marketplace is integrated throughout our site giving contextual listings of services. So, if a member is reading about Email marketing or Marketing Automation, they will be recommended tools and services in this area, putting it in front of our annual audience of 4 million users. Within the marketplace there are options to search by location too and vertical sector too, so you will feature more highly as searchers drill-down to look for services. These users are on our site because they are interested in solutions to their marketing challenges, so are the perfect target audience for your company. Smart Insights gets 750,000 page views and 350,000 unique users per month, who are on our site to improve their digital marketing ability, making them perfect leads for your services. By having an enhanced listing, your business will stand out, rank higher in searches on our site and prospective customers will be able to click through to your website for you to convert. In addition by taking out an enhanced marketplace listing you can post 1 blog post per quarter with us, provided those blogs provide good quality digital marketing advice. Because our blog is very well read, this gives you the opportunity to establish your brand as thought leaders, and to draw more attention to your marketplace listing by linking back to it. In addition to this, you can also request a Smart Insights review of your service if you would like it, which will be added to your marketplace listing. This provides prospective customers with guidance from a source they trust, so they can make an informed purchase decision. To get the most from your listing, make sure to fill out all the sections that the enhanced listing allows, and select the service and industry types relevant to your business. Don’t forget to add your logo and testimonials from satisfied customers as well. Being able to post 1 blog post per quarter with us will also help your marketplace listing get seen and generate you leads, so get in touch with your ideas for blogs if you have an enhanced listing but have not published a blog with us yet this quarter.